The Radcliffe is an applied molding door, although the door’s look would belie this. The molding is actually installed right to the framing bead area and does not rise above the face of the door’s frame, so it is very understated. The molding creates a ‘trough’ or deep groove at the framing bead area. 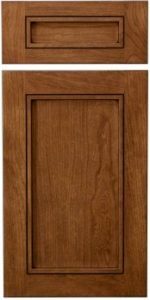 It holds glaze well but is a unique design, so we suggest ordering a door sample before ordering a full job, just to be sure this door creates the design look you are expecting. Not available in inset. Yes - Standard as shown (L-966), all other 3/4" profiles available. Yes - Mullion and frame only available, up-charge applies, also incurs special lite charges. Mullions are square bead.